2017 Stonehenge Summer Solstice Open Access Arrangements. English Heritage is pleased to provide free Managed Open Access to Stonehenge for Summer Solstice 2017 and ask that if you are planning to join us for this peaceful and special occasion that you follow these Conditions of Entry. These are written to ensure enjoyment and safety for everyone attending summer solstice at Stonehenge. The Solstice Car Park opens at 19:00hrs on 20th June with last admissions at 06:00hrs (or when full if earlier) on 21st June. The car park will close at 12.00 noon on 21st June. Stonehenge Guided Tours are offering their usual small group tour from London and Solstice Events are offering their annual pilgrimage from Bath. 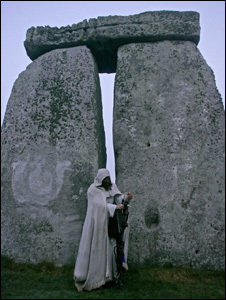 Visiting Stonehenge this year for the Solstice Celebrations? BREAKING NEWS: Geophysical survey reveals secret chambers and corridors underneath Stonehenge. Most people are unaware of the underground chamber that lies beneath Stonehenge. The six entrances to it are clearly visible in the recent geophysical survey, arranged as a squashed hexagon with linking corridors between them, leading to the antechamber located below the North Barrow and the main room directly below the stone circle. Col. William Hawley’s excavations of 1926 revealed the existence of the entrances and corridors, but he didn’t investigate further as he was already in his mid-70s and had been abandoned by the workers assigned to assist him. The records of this discovery existed only in Hawley’s personal notebooks, which lay unexamined until the mid 1950s. In 1958, under the pretext of re-erecting a collapsed Trilithon, Richard Atkinson’s team made extensive excavations in the centre of the circle in an attempt to break through to the main room after the route via the antechamber was discovered to be blocked by a massive sarsen stone. While the waiting crowd’s interest was held by the struggle to put back up two massive uprights and a correspondingly huge lintel, the real work in the centre circle continued for 4 months and 1 day. Very few photographs exist of what was found once the chalk capping of the main chamber had been breached, but Atkinson’s archive was badly catalogued so it has been difficult to attribute photos to positions with any kind of accuracy. A particularly tantalising, but unlabelled, photo has emerged. Atkinson never published what he found, in fact his only report of the extensive 1950s excavations and restorations were two popular books – one called “Stonehenge”, and the other called “What is Stonehenge? A Guide for Young People”. Towards the end of the project the decision was taken to fill the main room, antechamber and access corridors with concrete to prevent the collapse of the monument above. Was this a cover up? As far as the world’s press and the public were concerned, the project had been a huge success – a Trilithon that had collapsed in 1797 had been restored along with stones from the outer circle that had fallen on the last day of 1900. Publicity photos showed Stonehenge “restored” to something approaching its former glory. Occasionally an photograph appears on eBay claiming to be from the archive of Atkinson’s benefactor Sir “Polo” Divans, the likely recipient of any finds from the main chamber. This is one of a peculiar object from his collection. The six entrances were left unsealed but capped with metal covers at ground level – these can easily be found in the grass – and once a year there is a stress test of the concrete infill to ensure no subsidence or cracking has occurred. This is achieved by pumping chemical smoke in at one entrance and checking for leaks at each of the other five. Bizarrely, there was a Doctor Who episode filmed at Stonehenge in 2010 entitled “The Pandorica Opens” that used the idea of an “Underhenge” beneath the monument. Perhaps someone on the production or writing team had some inside knowledge of what really lies beneath. The rest of us will never know for sure.